A letter for Punchestown in 11 easy steps! With the Punchestown Festival getting under way today at the Co Kildare track the five day meeting has a heady mixture of quality racing and serious punting added to by fun and frolics. With Graded races, quality handicaps and some extraordinary adventures over the banks these will primarily have my focus. The old puritan streak within me sometimes shys away from the frocks, fun and frolics so I will only look at the horses for the eleven letters for Punchestown! 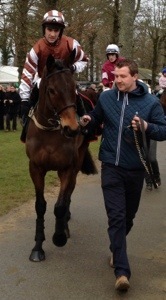 Patsio holds a couple of entries at the festival for Co Tipperary based Philip Fenton. The Moscow Society 6 year old gelding opened his account at Limerick earlier this month when just holding Arctic Skipper under Richie Kiely. The bumper races will be very hard to win this year so an each way option could be considered. Fenton has a good yard stick at his Carrick On Suir yard in the shape of Value At Risk so it will be interesting which race he pitches Patsio in. Urano, a French bred son of Enrique has taken quite a time to get the hang of hurdling since transferring to Willie Mullins ,Co Carlow base. The 6 year old won three bumpers on the trot in his native France but only won his first race in Ireland over hurdles in January of this year. That was at his seventh time of asking with Mullins immediately pitching him into Graded company afterwards. With three unsuccessful races under his race, an opportunity might just arise in handicap class over the coming days. He holds a couple of interesting engagements and with the ground hopefully not being to quick he could be worthy of a financial interest. Ned Buntline is another very interesting 6 year old running this week for Noel Meade and JP McManus. The flat bred son of Refuse To Bend is lightly raced having won 3 of his 9 races to date. His last race was at the Cheltenham extravaganza in March where he came out second best behind Savello in the final race of the four days. An entry in the Grade 1 Ryanair and the Grade C handicap chase over two miles on the 1st of May are his options, with the handicap a more likely option. JP McManus is always keen to win at Punchestown and Ned Buntline could be a likely flag bearer at a good price. City Slicker is yet another horse that races in the green and gold colours of the previously mentioned JP McManus. Trained by Willie Mullins this son of Kings Theatre had some nice form to his name earlier in the season. Tried in a couple of handicaps at that stage the decision to challenge for some Grade 2 novice hurdles on his last two starts didn’t pay off. He looks likely to race on the first day of the meeting and back in handicap class he looks a likely an each way chance even with a heavy weight. He is yet another 6 year old and believe me I’m not ageist but these horses are what the letters are throwing up! Hurricane Fly is no 6 year old, with the 10 year old Montjeu gelding having walked across Irish racing since 2008 as a champion. A dual Cheltenham Champion hurdler he relinquished his crown again this year when finishing fourth in March behind Jezki. Having beaten this horse on at least two earlier occasions at Leopardstown, he seemed to have been beaten fair and square on the day. Punchestown however is a totally different challenge and in the past five years Hurricane Fly has won at every festival. I would say that he prefers the undulations at Punchestown, acts better on the ground that is on offer at the track and given his class has every opportunity to win again. He will be an enormous attraction on Friday and I for one will be hoping he can seal a wonderful season in the Grade 1 Racing Post Champion Hurdle. Express Du Berlais is trained in Co Wexford by Colm Murphy and the 5 year old Saint Des Saints gelding could be an interesting challenger for Gigginstown House Stud. 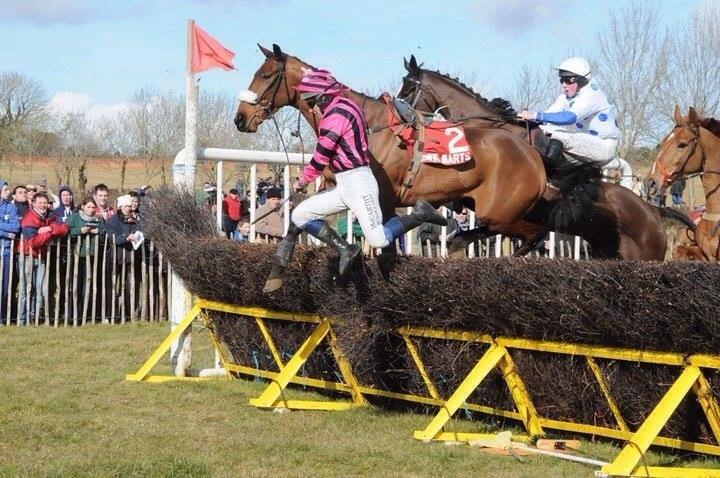 A point to point winner under Derek O’Connor in April 2013, he took a little handicap hurdle at Down Royal on St Patricks Day and holds two engagements. He will be a light weight in any of these races, but Murphy is very capable of mapping out a race for a runner at a nice price. Sizing Europe was on my list at Cheltenham and the venerable 12 year old son of Pistolet Bleu ran a fine race only finishing 9 and a half lengths fourth behind Sire De Grugy. With 20 career wins and having earned £1.2 million for his owners Ann and Alan Potts he has been a star performer for Henry De Bromhead’s Co Waterford yard. Making his debut in 2006, he has run in every year since, winning Graded races over hurdles and fences in the interim in nearly every year. A contemporary of and having raced against Sprinter Sacre, Big Zeb, Kauto Star and Hardy Eustace it is extraordinary that he still has the ability and enthusiasm to have a live chance at Grade 1 level. Is it possible that he can win the Boylesports.com Champion Chase ? Yes. Can he ? I don’t know ! But it would be romantic to see him stride home in front under Adrian Lynch one more time. Trifolium has travelled to Britain to race at Cheltenham and Aintree over the past two months for Co Limerick trainer Charles Byrnes. Well fancied on both occasions he has finished third on both days in these Grade 1 novice chases. A winner over Felix Yonger in January in a Grade 1 at Leopardstown the Ryanair Chase could be within his scope. The French bred 7 year old son of Trifolium might just prefer an easier surface to race on but the Gigginstown House Stud horse will make them all travel. On His Own was touched off in Cheltenham Gold Cup in a desperately close finish in March. Supplemented for the race by Willie Mullins for Graham and Andrea Wylie, his running was justified with a decision taken to bypass the Aintree Grand National to run here. With an entry in the Grade 1 Punchestown Gold Cup the returning Ruby Walsh might be doing a Frankie Dettori flying dismount if he wins. I saw him win the Thyestes Chase at Gowran Park in January having been given a great front running ride from Paul Townend. He seemed to handle the good ground at Cheltenham well and the going here could even be quicker, so maybe that could pose a problem or two. That said the 10 year old Presenting gelding is in the form of his life and might bag a big pot here. Western Boy has been one of Pat Fahys novice “finds” of the year. The 5 year old Antonius Pius gelding won his bumper in November and was pitched into Grade 1 novice hurdle class at Cheltenham behind Vautour. Beaten a little over 10 lengths he looks capable of running another good race here. 2 miles seems to be his trip and a booking for Davy Russell could be significant, be aware! Noble Prince hadn’t won a race since October 2011 until popping up at Thurles in 2013 in a Listed race. This former Cheltenham winner, has loads of ability but the German bred son of Montjeu is a wild card each way chance if Paul Nolan runs him. He ran very well over hurdles at this years Cheltenham Festival and could be worth a second look if he is in the mood. Thats a letter for Punchestown in 11 easy steps! 28th Naas(e), 29th Punchestown (e), 30th Punchestown (e), 1st Punchestown (e), 2nd Punchestown (e), 3rd Punchestown, Gowran Park, 4th Sligo. 2nd Killultagh, Old Rock & Chichester (H), 3rd Killultagh, Old Rock & Chichester (H), Stonehall (H), 4th East Galway (F), Muskerry (F), 5th Muskerry (F). As Codd retains his slender lead with 21 meetings over 5 weekends to go, its going to be fun! 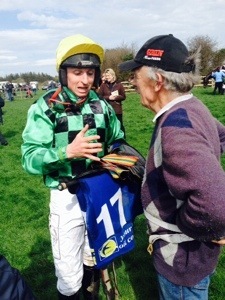 The Battle between Jamie Codd and Derek O’Connor moved onto Dromahane today where the Doneraile Hunt staged their spring meeting at the Co Cork track. With these two jockeys going head to head here following a treble each yesterday at Loughbrickland and Ballyarthur ,Codd was defending a slender lead of one from O’Connor with Codd on the 70 winner mark. With a bumper entry here the possibility of a divide was always on the cards with three of the races divided, giving racegoers a nine race card. With all the focus on the battle between our two leading amateurs, this did not deflect the other jockeys from booting home a winner or two. O’Connor got the ball rolling in the very first race when partnering Pat Doyle’s 4 year old Au Quart De Tours to an easy win. This son of Robin Des Champs won this race easily, with the Walter Connors owned French bred likely to head to pastures new after this. The second division of the Grange Stud sponsored race went to Co Wexford based trainer Richie Rath whose Rathnure Rebel won under Rob James. This Beneficial gelding lead all the way under this seasons leading novice rider. O’Connor now on the 70 winner mark following his first winner, popped his head in front thanks to Marvellous Moment. Trained by Co Cork based Jim Culloty the Turtle Island 5 year old handled the ground well to win the first divide of the Glenview Stud 5 Year Old Geldings Maiden. With Mitchelstown based Eoin O’Brien taking the Dairygold/Pegus 5 Year Old Mares Maiden on the Presenting mare She’s Da One for Daniel Murphy and Barry O’Neill winning on Call The Detective for Shark Hanlon in the second divide of the Glenview race Codd was hitting the bar and not scoring. With five races down and O’Connor now one ahead, Codd needed to raise a winning flag. This he did in a stirring finish with O’Connor when he managed to ride Sizing Titanium home a winner a neck in front of Beat The Index. This 6 year old son of Flemensfirth , owned by Alan Potts and trained in Co Dublin by Jim Dreaper didn’t have the experience but battled well. The Winners of Three race saw the find of the season Venitien De Mai win for the fourth time for the same partnership of Codd, Potts and Dreaper. Potts has invested considerable money in horse racing and his involvement in point to pointing is to be welcomed. With wins at Rockfield, Tinahely and Oldtown already with the 5 year old Network gelding Venitien De Mai this is a promising sort who will be handled gently I would imagine. This second winner of the day saw Codd back in front with his slender one winner lead intact. The Open Lightweight saw Kellystown Lad spring a surprise for Eugene O’Sullivan with the 11 year old Old Vic gelding winning for the fourth time between the flags but the first in the colours of Stuart Crowley and in the hands of Barry Crowley. The ninth winner of the day came in the Dan Joe Fitzgerald sponsored Older horses maiden when Co Wexford based Shay Slevin saddled Treo Eile to win at the tenth time of asking. Ridden by Fermoy based Brian Lenihan, this young jockey was pleased to win locally on the 6 year old Exit To Nowhere. So its 21race meetings to go over 5 weekends, its going to be fun! With just 22 meetings to go Codd and O’Connor offer a battle not to be missed. The Jamie Codd and Derek O’Connor battle continued in earnest today with both men managing to record a treble. With just one winner separating them (67-66) Codd opted to go north to the Loughbrickland , Co Down fixture, while Derek O’Connor travelled to Fermoy, Co Cork in his quest for winners. The Northern region has been a happy hunting ground in previous seasons for Codd, but this year the competition has very strong with Codd, fellow Wexford man Barry O’Neill, O’Connor and Noel McParlan all just separated by only two winners. Codd got the leg up on the Dan Doyle trained, The Bosses Wife in the Tattersalls Mares Maiden with the 6 year old Classic Cliche mare making all the running to win. 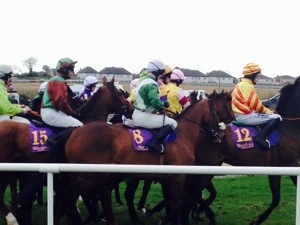 Racing in the colours of Kathleen Ferguson, this mare registered with the Island Hunt in Co Wexford opened her account here to win at the seventh time of asking. The Gigginstown House Stud’s silks were seen in the winners enclosure after the Albert Bartlett Geldings Maiden with Better Part Of Me making a winning debut. Trained in Co Meath by Gordon Elliott, the 6 year old Old Vic gelding caught the eye by defeating the better fancied Quiet Account. This horse has obviously been given time and could be an interesting running into the future for the Michael O’Leary operation. Jamie Codds treble was achieved on the Paul Pierce trained Laser Hawk in the Winners contest. This 7 year old son of Rashar which the Pierces stood at their Blackhall Stud in Co Wexford was recording his own treble of sorts winning for the third time. The Pierces might try him again between the flags, but knowing them, they will probably try him on the track if he can operate on summer ground. Other winners at Loughbrickland included Willie Thompson on Birch Hill for Ian Ferguson, Highly Unlikely for Kevin O’Hare and Liam Lennon and Mark Lynch winning on Twisted Psychology for Thomas Coyle. 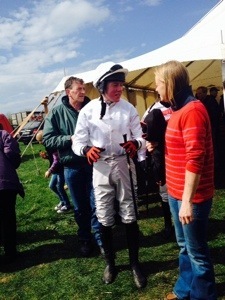 Derek O’Connor has a very good strike rate with runners from Robert Tyner’s Kinsale, Co Cork base and it continued today at Ballyarthur for the Killeady Hunt meeting. They opened their account in the Winners contest sponsored by the Cork and Waterford Trainers, with Fiddlers Way. This 6 year old Shantou gelding continued his progress here when winning in the silks of Noel Hanley. Tyner has this horse going in the right direction now and could win again before the season is out. O’Connor and Tyner took the final race on the seven race card when winning with Burgess Dream. This 5 year old Spadoun gelding took the Crossbarry Inn and Gain Horse Feeds maiden for Michael Kearney. This winner saw O’Connor keep pace with Codd as he had earlier in the day won on Yur Next for Paul Tobin. This 6 year old Definite Article mare won in a tight finish in what has been reported as an eventful race. The West Waterford registered mare was completing her first point to point and won in the ownership of Elizabeth Fuller. With one race divided here the other four contests saw James “Corky” Carroll win on both Aqua Dude and Private Malone. The Donnchadh Doyle trained Aqua Dude, a 4 year old by Flemensfirth looked an above average winner of the Goffs Bloodstock Maiden , with a date at the sales the likely next outing for this Monbeg Syndicate owned horse. Aiden Kennedy’s Private Malone had the form to win the 5 Year Old Geldings Maiden and so it proved with Carroll winning on the 5 year old son of Darsi. The other two winners here went to Mikey O’Connor on Castlebeach King for Thomas Cummins and Ciaran Fennessy on Go Philosophical for Pat Crowley. These results sees Derek O ‘Connor remain one adrift of Jamie Codd with the Galway man on the 69 winner mark, but he has opened a gap of 2 over Mikey O’Connor in the race for the Southern Region champion. Its onto Dromahane tomorrow, which will be the first of the remaining 22 scheduled fixtures till seasons end on the June Bank Holiday weekend. With Robert Tyner 7 clear in the Handlers championship, this looks his to lose now, but with Codd and O’Connor booting them home with such regularity this is a battle not to be missed. The Open Lightweights promise much at Loughbrickland and Dromahane. With Easter out of the way the point to pointers have only six weekends till seasons end over the June Bank Holiday weekend. 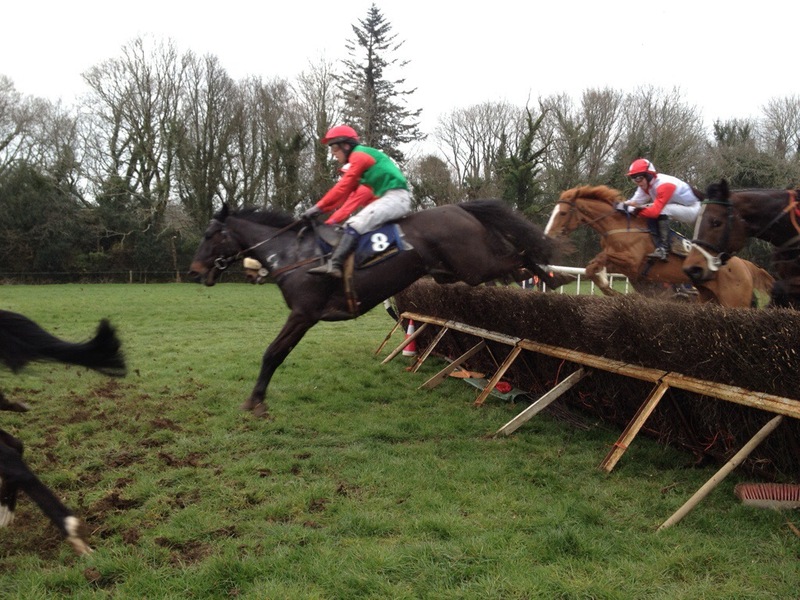 Action this weekend sees Co Cork hosting two of the three meetings on offer with the Killeady Hunt racing at Ballyarthur on Saturday and the Doneraile Foxhounds at Dromahane on Sunday next. The only meeting down south that stages an Open Lightweight is the Dromahane meeting where the Novice Riders have the race to themselves. 12 horses are entered here with the O’Donovan brother and sister team of Chris and Kate will be trying to add to their memorable victory two weekends ago with Optimus Prime. The 13 year old son of Anshan has been well handled by Kate O’Donovan to get back to form after two years off the track.A win over Vincent Halley’s Boxing Along is a good measure of 2014 form and the O’Donovans could make a bold bid to win again. Eugene O’Sullivan has had Pocket Reader on the go all season under the guidance of Irene Walsh. Not having run since Kilworth on the 16th of March, the 8 year old Sonus gelding probably needed a little break to sweeten him up. The Kiely family from Co Waterford have knocked great sport out of Powerfulpaddy with Rachael Blackmore developing a great bond between them. Another 13 year old this son of Aboo Hom was a close second at Templemore two weekends ago behind The Hollinwell might see him playing a lead role here. being a significant step up having taken a Winners contest at Monksgrange in March. With Killeady sharing Saturday with the Co Down meeting at Loughbrickland it will very interesting to see just where Messrs Codd and O’Connor ride. Its pretty much head to head now in the jockeys championship, but if Bally Beaufort tries his luck in the Open Lightweight at Loughbrickland Derek O’Connor wont forego the winning chance. The 6 year old son of Old Vic did win at Loughanmore on Tuesday , but with 5 wins already to his credit this season the McKeever/Dennison team might just be tempted again. David Christie has Slippers Percy, The Last Derby and Subaroo Blue amongst the 14 entries so he will have to have the wisdom of Soloman to choose between them! But maybe he wont choose and run all three. While Robert Armstrong’s Send For Paddy might strike again for the veterans here with the Mister Mat 13 year old capable of making them all run. This La Mon Hotel & Spa sponsored event might be the race of the weekend as neither Jamie Codd nor Noel McParlan are likely to miss the chance of winning the Northern Regional title. It promises much for the racing enthusiast, don’t miss it ! After todays action at Loughanmore all bets must be off! Derek O’Connor’s great form continued at Loughanmore for the two day East Antrim meeting with the Galway man riding four winners, headlined with a treble today at the northern venue. O’Connors three winners, Ground Invasion, Bally Beaufort and Nevada Rose have now put him only one winner adrift of Jamie Codd , who managed a winner today in the shape of Abhainn Dubh. Both of them booted home a winner a piece at the same venue yesterday with Maple Mons winning for Codd and Horsehill taking his race under O’Connor. With Co Wexford based Codd on the 67 winner mark and O’Connor on 66 it clearly shows just how well both men have been riding this season, but at this stage all bets must be off as to which of them will win out in the end. John Barry from Co Cork had a very good weekend himself with a pretty nice double at Ballydurn with the Oscar gelding Redwood Castle for Pat Doyle and the Brian Boru mare Tom’s Girl for Willie Murphy. That of course didn’t finish it for Barry as he travelled to Cork on Monday and caused a 33/1 shock when winning the Hunters Chase on Oscar Barton. Trained by Sam Curling for his father Peter the 9 year old seemed to enjoy the ground and probably more importantly the two and a half mile trip to beat Mossey Joe. Also on the double was Noel McParlan at Loughanmore with the Co Antrim man winning on Itsnoteasyted and Let’s Be Famous for Colin McBratney continuing his very season both on the track and inside the rails. Harley Dunne and Michael Goff had their own double of sorts with a pair of 4 year old winners , Micks Lad by Beneficial at Ballydurn and Different Gravey the next day at Loughanmore. Its good to see Dunne back in winning form but with 5 winners between himself and Rob James he may not be able to make up the deficit over the coming 6 weekends. Just whether Maxine O ‘Sullivan can be reigned back in the Ladies Championship looks increasingly unlikely. With another Open win, this time at Stradbally, on The Holinwell O ‘Sullivan is now 4 winners clear of her nearest pursuers and riding like a champion. This horse has now won 6 point to points this season for the O’Sullivans ,level with The Last Derby and 1 clear of Bally Beaufort making this contest a very lively one in itself. All three of these horses have played their parts so far in the championship ambitions of Maxine O’Sullivan, Rob James and Derek O’Connor and I would reckon its not finished yet! When you throw in winners for a returning Pat Collins, in addition to Barry O’Neill, RJ Condon, Tim Donworth ,Benny Walsh, MJ O’Connor, John Kinsella, Kevin Power and Willie Thompson and you get some idea as to how fiercely competitive it is on the track and in the weigh room between the flags. 21st Cork, Fairyhouse, 22nd Ballinrobe (e), 24th Tipperary (e), 25th Dundalk (e), Kilbeggan (e), 26th Limerick, 27th Gowran Park, Limerick. 21st East Antrim (H), 22nd East Antrim (H), 26th Killeady (H), Co Down (S), 27th Doneraile (F). Five for O’Connor in Clare puts the pressure on. With racing on the track today at Cork and Fairyhouse in addition to three Point to Point meetings many racing yards would have been under more a little pressure. But pressure is more than a little good for us all as sometimes it helps us focus and achieve even more. 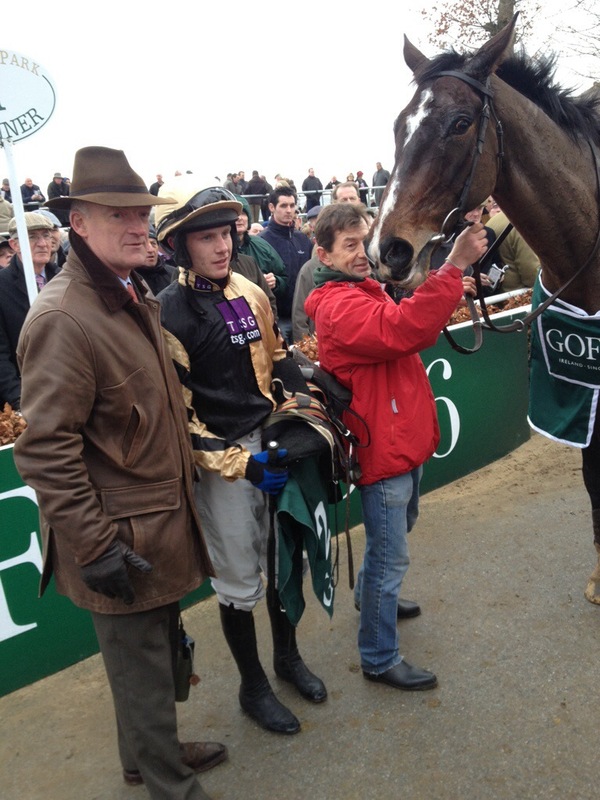 Jamie Codd started the week 7 winners clear of the defending champion Derek O’Connor in the national jockeys title. 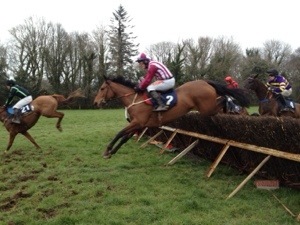 With racing mid week at the Inch Point to Point at Killeagh O’Connors double ( with a net gain of 1) closed the gap to 6 bringing the battle to todays meetings at Quakerstown in Co Clare, Stradbally in Co Laois and Ballydurn in Co Waterford. O’Connor chose to pop across the county boundary to Clare while Codd made the trip from the South East to Laois. With a fabulous five timer for O ‘Connor at Quakerstown, Codd must now be feeling a small bit of pressure as his own useful double ( The Well Road and Our Commander) at Stradbally sees O’Connor cut his advantage to just three. With two further meetings at Loughanmore this coming week on Monday and Tuesday the sports to most successful jockeys will be battling it out. With JT (Corky) Carroll taking the opener at the Co Clare Hunt meeting on 4 year old Donnchadh Doyle gelding Our Robin it was a clean sweep for O’Connor after this. Co Wexford based Doyle seems to have a nice sort here in the Robin Des Champs with the Monbeg Syndicate owned horse likely to race for a new owner next. O’Connor started the ball rolling in the 5 year old geldings maiden with the Golan horse, Golan To War for his brother Paurick. He looked a shoo in on his point to point form and so it turned out. With Big Bad Bob as your sire many would expect to see a mare racing on the flat or at least on the track. Robert Tyner is a fairly versatile trainer with the Co Cork based man saddling Broadway Babe to win her maiden under O’Connor. Previously raced on the track in Britain she will likely go back that route after this win. This was the first of Tyner’s winners today as the same partnership took the Older geldings maiden with Goline, helping Tyner solidify his lead in the race for champion handler. From O’Connors view point it is great that he has the support of such a powerful yard to draw on and also fortunate that other trainers such as Jim Culloty use his services. The Cheltenham Gold Cup winning colours of Lord Windermere got an airing here with the Culloty trained River Of Time taking the Winners of One. This Oscar gelding is lightly raced and has now won 2 of his 3 completed races. Some of the Confined races at these meetings can be a little light in numbers and nearly always in quality. But a win is a win, with Brian Hassett happy to welcome his winner One More Tune completing Derek O’Connors fivetimer. So its Loughanmore on Monday and Tuesday, with a really good Qualified Riders card at Cork on Monday enticing the army of amateur jockeys to try their luck at these venues. But O’Connor and Codd will be up north, with only 3 wins now between them all could change in a day! The pace is likely to be fast and furious in the Irish National at Fairyhouse. Some very famous names have been linked to previous Irish Grand Nationals with some memorable ones springing to mind including Arkle, Brown Lad, Tied Cottage, Flashing Steel, Desert Orchid and so so many more. With 30 runners declared for the Boylesports sponsored 3 mile 5 furlong contest the pace is likely to be fast and furious with the good to yielding ground likely to encourage a pretty strong pace. For the number crunchers amongst us 20 of the declared runners fall into the eight years or younger category, with 4 six year olds, 9 seven year olds and 7 eight year olds making it a pretty interesting statistic to keep in mind. With the end of the national hunt 2013/14 season within sight, most 6 year olds are likely to be coming to the end of their first season over the larger obstacles and could be on an upward curve. Similar mention can be made for the 9 seven year olds declared with many first and some second season chasers likely to play a major role. Aintree Grand National winners in the past few years has seen older horses with form, but by no means headline grabbers take that race, but this race might just have a subtlety different winning template. Last year Fairyhouse saw Liberty Counsel spring a surprise and she wasn’t the first such winner ( including Bentom Boy) to triumph at the Co Meath but these outsiders are the exception here. Dot Love did send last years winner to the Cheltenham Festival last year prior to her win in the Easter Monday highlight and 8 of the 30 horses have travelled the same route, with 2 having run at the Aintree meeting. So where is all this pointing? To be truthful it is hard to decipher any trend or strand of historical form that would lead firmly in a particular direction. So lets just look at a few that might give us a run on Monday in a particularly open and not a particularly classy renewal. Much noise is coming out of Co Cork this week as to the merits of the Liam Burke trained My Murphy with many looking to Mallow man to follow in the hoofprints of Corkonions Brittany Boy and Bluesea Cracker. The 8 year old Presenting gelding would be no surprise winner as he is in good form, hasn’t been over raced this season, is a novice chaser , jumps well , will enjoy the trip, has nice weight and will be ridden by a good jockey in the shape of Robbie Power! 1 lb above him in the weights is last years third placed horse, Home Farm. Again to be ridden by David Casey he is 8 lb higher in the weights and without a win since beating White Star Line in February 2013 , he has however only run three times since last years race.The 7 year old son of Presenting (yes that Rathbarry/ Glenview horse again) is trained by Arthur Moore in Co Kildare and this man and his family are already part of the Fairyhouse lore and he could be in line to write another chapter. The Mangan family from Conna Co Cork have I feel a live chance in the shape of Letter Of Credit with Paddy Mangan taking the mount on the 9 year old Bob Back gelding. This Grade 2 placed novice chaser has encountered slower ground this season but he did manage to win at Thurles on good ground. Its decent form and Mangans little wooly cap could be seen in the winners enclosure a little after 5pm on Monday. I personally don’t think that Jim Dreaper’s Goonyella will enjoy the quicker ground, but I’d give some hope to his Thyestes Chase second Los Amigos. This Overbury 7 year old has a nice weight , is not over exposed and will give Eddie Connell a real chance of glory. I have been following the exploits of the Liz Doyle trained Rich Revival all year and was very taken by his recent third over hurdles at Navan at the end of March. With Brian O’Connell riding the 2014 Cheltenham Hunter Chase winner Tammys Hill Sean Flanagan gets the call up on the only 10 year old in the race. By Turtle Island I would be more comfortable and confident if we had a drop of rain to ease the going, but if Co Wexford based Doyle allows the horse to take his chance I will take the sign as a positive one! Thats it, its a very open race and why wouldnt it be with the money on offer? Ive not mentioned JP McManus nor Gigginstown House Stud, nor Barry Geraghty nor probably the race winner, but thats the beauty of racing!!! The next seven weekends promise much in the point to point fields. 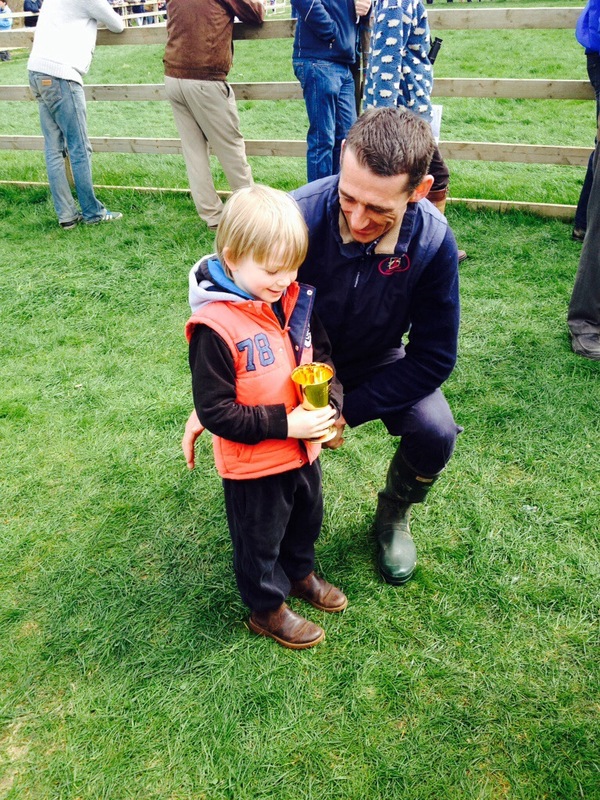 With only seven weekends to the end of the point to point season all the championships are getting very competitive. With Jamie Codd on the 63 winner mark , putting him 6 clear of Derek O’Connor these two men look like having the national jockeys title between them. The regional titles are all but decided in the East and the West with Codd and O’Connor looking like they have these wrapped up. The Southern Region is a different matter with Derek O’Connor and his namesake Mikey involved in a fair tussle with only the one winner separating them and all to play for with Declan Queally back in third place and not likely to pass both of them. While the action in the North sees a rare battle with Barry O’Neill and Jamie Codd level on winners, closely followed by Noel McParlan , Derek O’Connor and Ben Crawford. A good run by any of these give might see them crowned champion in 2014. On the novice riders front young Wexford man Rob James has been red hot of late, particularly when partnering runners from the David Christie yard. Now 7 clear of Harley Dunne, last years champion will struggle to attract enough rides and winners to get past James at this stage. A quick look at the Ladies section sees Co Cork based Maxine O’Sullivan having put put daylight between herself (3 wins) and Rachael Blackmore and Evanna McCutcheon while Kinsale based Robert Tyner has increased his lead in the Handlers category, putting him 4 winners clear of the pursuing David Christie. They will all be out this weekend, with five meetings in total stretching from Sunday the 20th at Ballydurn, Quakerstown and Stradbally to Loughanmore on the 21st and 22nd. The focus of the Open Lightweights sees three down for decision with competition kicking off at the Laois Foxhound meeting with the Ashbourne Meats Open. 18 entries sees a pretty good field assembled here with last weekends Oldcastle winner Vital Plot likely to be well supported for the Jamie Codd and Liam Kenny partnership. The Hollinwell might try his luck here for the O’Sullivans with Maxine likely to get the mount as she tries to strengthen her lead in the Ladies championship. Nedzers Return and Oscar Barton cannot be ruled out either with great interest in the returning Florida Pal. The ground here should be no worse than good, so that will rule some runners out and some runners in! The Wilson Mares Open at Loughanmore on Monday has only 7 entries, with a number of mares look to step up in class including Forgotten Lady for Aidan Firzgerald , Fruits of Dreams for Donnchadh Doyle and Maple Mons handled by David Christie. The second Open of this Mid Antrim Harriers meeting sees 12 horses listed in the Whitemountain Quarries event on Tuesday. Slippers Percy heads the field here with David Christies horse in great form this spring. Watch out here for any one of the Colin McKeever horses , Bally Beaufort or Carlanstown, while Robert Armstrongs Send For Paddy has been in good form and could make them all gallop! With notable wins last weekend for Mark O’Hare at Oldcastle , Chris O ‘Donovan at Dromahane and James Rath at the same meeting the next 7 weekends promise much.